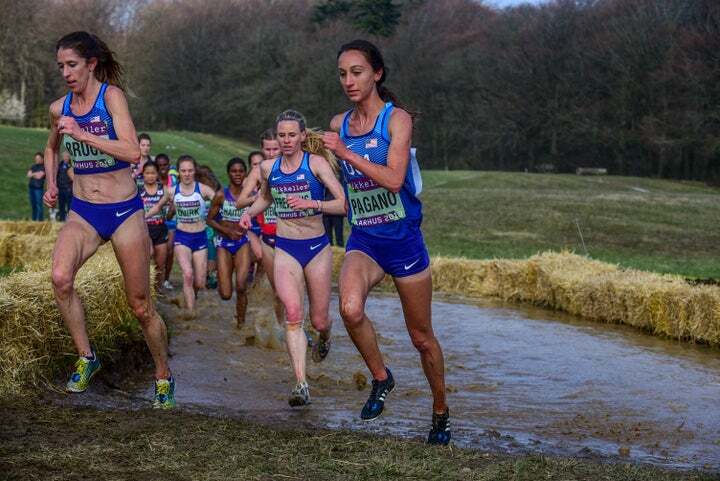 On a difficult course in Denmark, Team USA placed eighth on Saturday at the 2019 world cross-country championships. Rumor had it that race officials for the 2019 IAAF World Cross Country Championships had something special in store when it came to the course design in Aarhus, Denmark. They didn’t disappoint, according to the athletes who took the challenge on Saturday, at the notoriously competitive race. The 10.24 kilometers were broken up into five 2,000-meter loops. Each loop took the runners through a water splash, a mud pit, a sand pit, through a beer tent, up a 10-percent incline over the roof of the Moesgaard Museum, and around a 180-degree turn. While the field is always full of many of the best distance runners around the globe, the terrain was a challenge unto itself. The American women were led by Stephanie Bruce, who took 33rd in 39:09, followed by Sarah Pagano (50th), Anne-Marie Blaney (51st), Karissa Schweizer (56th), Marielle Hall (58th), and Courtney Frerichs (78th). Frerichs, who is the American record holder in the 3,000-meter steeplechase (9:00.85) and world silver medalist in the same event, said she was disappointed with her performance, but hoping it builds strength for the upcoming outdoor track season. Kenya’s Hellen Obiri, who is the reigning 5,000-meter world champion, won in 36:14, making her the first woman in history to claim world champion titles in cross country, indoor track, and outdoor track. After the race, she said she won’t return to the grass. Ethiopia won the women’s team gold, followed by Kenya (silver), and Uganda (bronze). 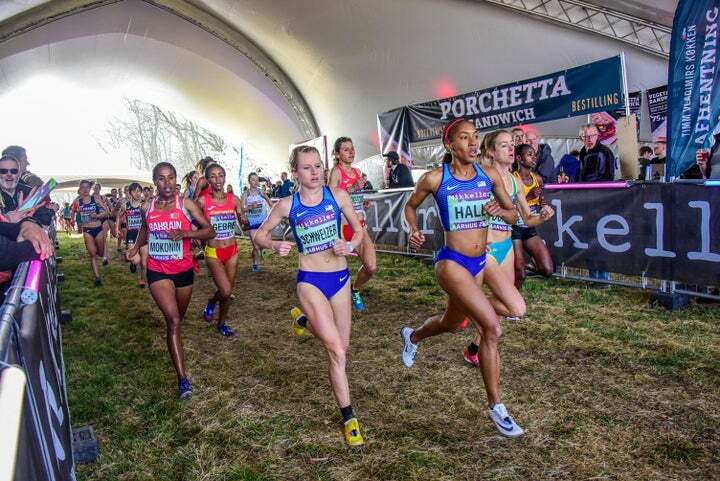 Karissa Schweizer and Marielle Hall of Team USA run through the beer tent, called Runner’s Valhalla, at the 2019 IAAF World Cross Country Championships in Aarhus, Denmark. 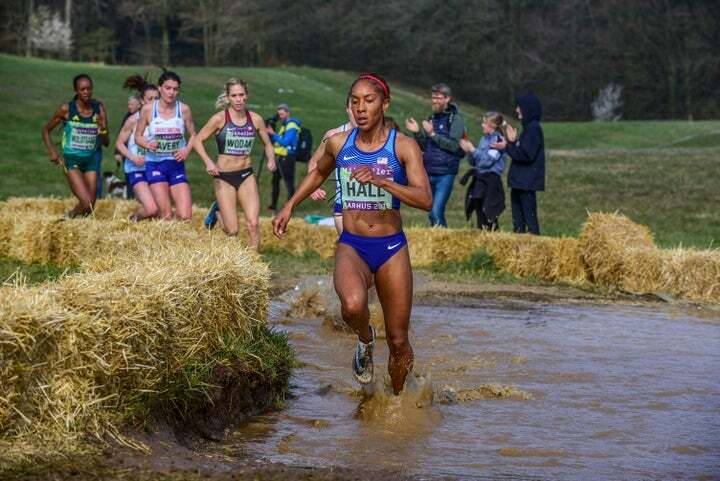 In one of many course challenges at the 2019 world cross-country championships, Marielle Hall splashes through the water pit. 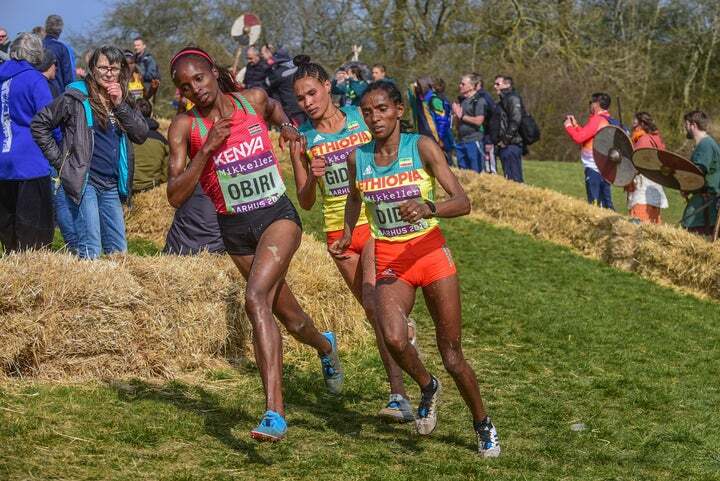 Hellen Obiri of Kenya makes one of several sharp turns, on her way to the 2019 IAAF World Cross Country Championships victory. Her win made her the first woman to ever take world indoor and outdoor track and field, and cross-country titles. PHOTO: Mike Scott Jennifer Nesbitt of Great Britain and Dominique Scott-Efurd of South Africa charge up a 10-percent grade incline, one of several big hills on the championships course. Stephanie Bruce leads Team USA down a quad-busting hill at the 2019 IAAF World Cross Country Championships. Bruce was the first American finisher in 33rd place. 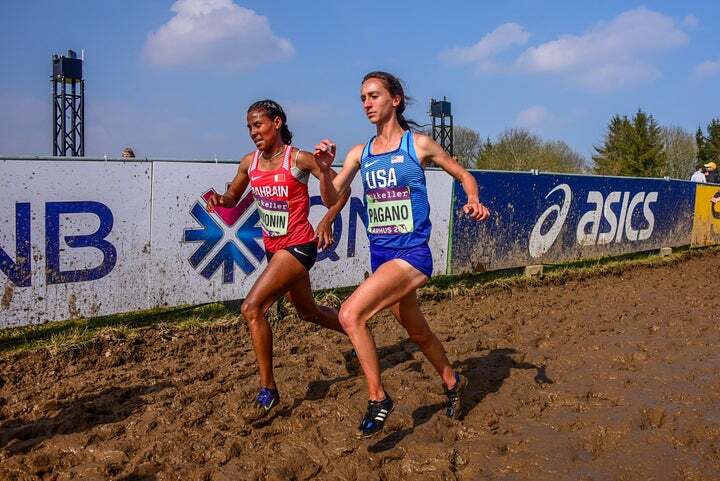 Sarah Pagano navigates the muddy section on her way to 50th place at the 2019 IAAF World Cross Country Championships in Aarhus, Denmark. She was Team USA’s second finisher. 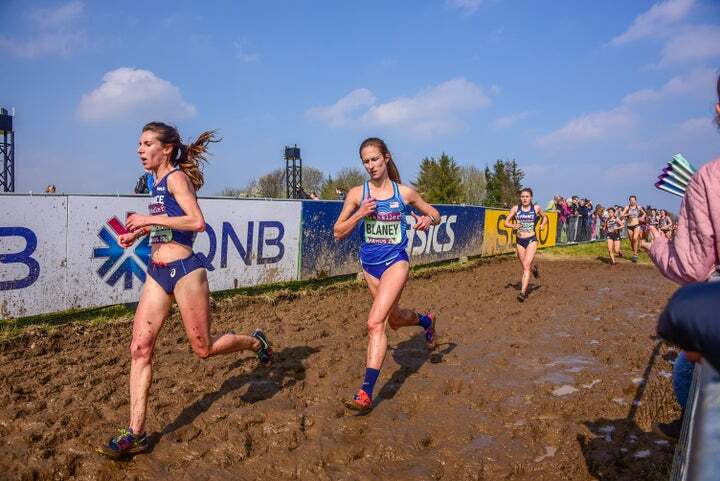 Bruce, Pagano, and Courtney Frerichs work through the water at the 2019 IAAF World Cross Country Championships. 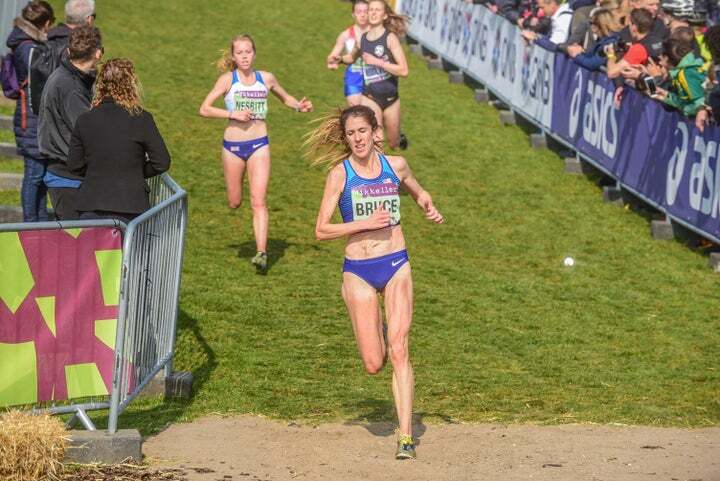 PHOTO: Mike Scott Ann-Marie Blaney runs to 51st place and third American at the 2019 IAAF World Cross Country Championships in Aarhus, Denmark.